Home Amazing The baby that was conceived just 18 months after its mother: Woman, 26, gives birth to baby girl from a donated embryo that was frozen for 24 YEARS - the longest ever. The baby that was conceived just 18 months after its mother: Woman, 26, gives birth to baby girl from a donated embryo that was frozen for 24 YEARS - the longest ever. 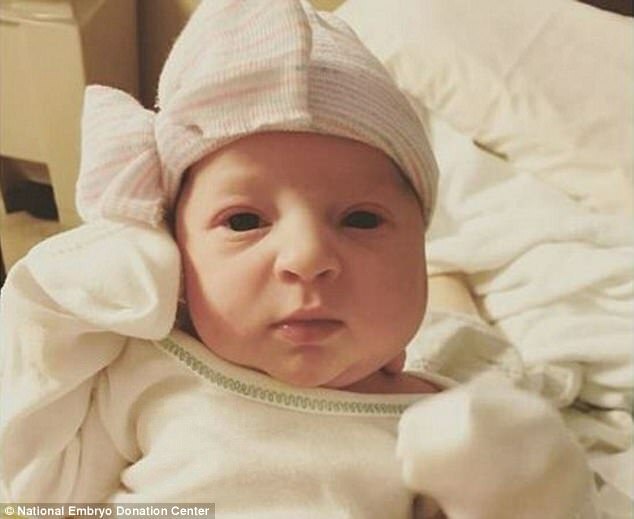 A 26-year-old woman has given birth to a baby girl from a donated embryo which was frozen for 24 years - the longest-ever frozen embryo to come to term. Tina Gibson's baby Emma Wren was conceived and fertilized 24 years ago in 1992, but the embryo was frozen instead of implanted. In March this year, the frozen embryo was thawed then donated to Tina and her husband Benjamin. After a normal 40-week pregnancy with no issues, Tina gave birth naturally to Emma on November 25. Emma was born weighing six pounds and eight ounces, and measuring 20 inches long. The couple from East Tennessee said they were overcome when they found out they could adopt an embryo after struggling to conceive. It is the longest time an embryo has been frozen, after one in Virginia which was frozen for 19 years and a few months. Experts say this successful birth 'suggests the shelf life of an embryo could be infinite'. The couple adopted their embryo through the Tennessee, which has led to 700 pregnancies since 2003 - more than any other organization in the world. 'It is deeply moving and highly rewarding to see that embryos frozen 24-and-a-half years ago using the old, early cryopreservation techniques of slow freezing on day one of development at the pronuclear stage can result in 100 percent survival of the embryos with a 100 percent continued proper development to the day three embryo stage,' said lab director Carol Sommerfelt said. Around 700,000 to over 1,000,000 human embryos are currently stored in the US.